Anthony lost his dad to an accident at a young age, and then lost his mom, Yuni, to cancer when he was in high school. Yuni’s best friend, Rita, took Anthony in and treated him like her own son until Rita’s urges got the better of her and she entered into a sexual relationship with Anthony. Anthony was a willing participant, but being a minor and Rita’s ward didn’t go down well with the police and they sent Rita to jail. Now Anthony is back in college and he’s having issues with getting into relationships. Luckily for him, Kay Goodman loves him very much and will not give up on him. 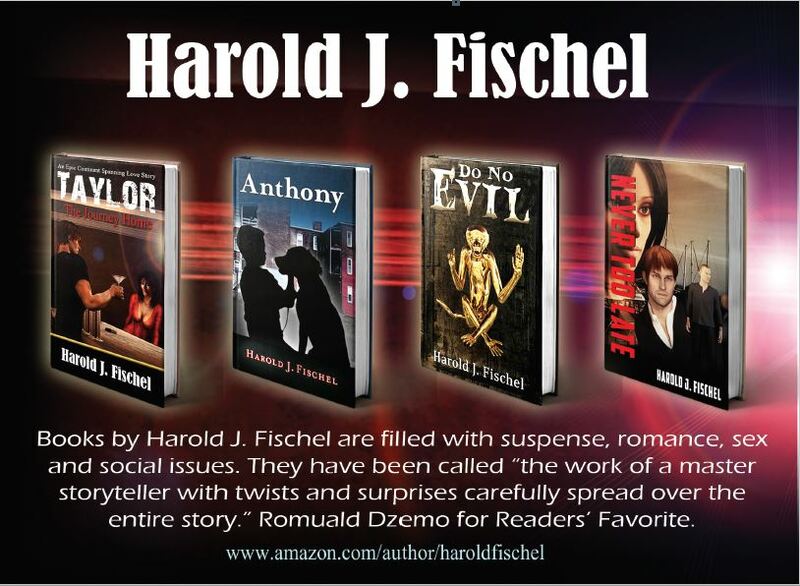 Will Anthony and Kay get together and have a happy ending in Anthony by Harold J. Fischel. Anthony by Harold J. Fischel is a wonderful coming of age novel. I loved the story of Anthony, but it didn’t seem to follow one plot line. There were lots of smaller stories crammed in the book, although they all revolved around Anthony. It was okay but everything happened too fast; there was conflict after conflict so that it felt like there was no real climax and the ending seemed abrupt. On the other hand, I welcomed all the surprises and I loved all the characters. Anthony was resilient and strong, even when he was still a kid. Everything he experienced growing up only made him stronger, some of the things that happened to him even made me cry. Aunt Rita was a really nice person who just made some mistakes. Kay was persistent and supportive in all that Anthony does. All the supporting characters also played big roles in Anthony’s success. Overall, a good book with great characters. The Author’s writing style is direct and filled with emotional drama which will keep you invested in the story. The characters are well defined and lend to the realistic feel of the story in a way that is relatable to the reader. Life is full of ups and downs, but it is the way we handle the difficult situations as well as the good ones that define us as people and build character. I feel that the crucial message in this story is to persevere no matter what the obstacle, and to believe in yourself and your ability to confront the situation and bring about a positive conclusion. This is a very captivating story that will compel you to examine your own life and the decisions you have made, good or bad. Anthony is the love child of mixed parentage – Bruce (Chip) Walker, an American Lieutenant General and Yuni, a Filipina fashion model. at a young age, his father dies in a plane crash. Anthony and his mom are then left to fend for themselves in a new neighborhood with his “Aunt” Rita. as Anthony grows up, he faces life head on despite the difficulties he encounters on the way. he meets friends and foes, falls in love and raises a family. the writing is simple, straightforward and has its shining moments. in fact, the author has a way of getting his readers involved that a tear or two are impossible not to fall as the occasion demands it. the characters with their flaws and virtues are larger than life and some may seem too good to be true. yet when one examines them closer, they are but reflections of life in all its beauty, madness and horror. i think the book’s ultimate message is that no matter what life brings you, it is how you deal with it that makes it worth living. Anthony faces it all and comes out of the battle alive. though scarred, he is not bitter. having the support of friends and loved ones too are important as Anthony realizes this in each phase of his life. the only “problem” i have with the book was the way it was concluded. it was too abrupt that i thought some pages were missing from the digital copy i was sent. at any rate, Anthony was a good read. it was enough to make me believe again that there are still good people out there and that even if bad things do happen to good people all the time, life does get better somehow. This is a realistic tale of love, loss, and triumph. It’s riches to rags, then patching the rags to make riches again. The characters are powerful and endearing making this a moving and thoughtful book.